So, I had this whole blog post planned about Mother’s Day (13 days for those who haven’t got their heads round the fact it’s March yet); it was going to be a total Gush Fest about how wonderful Mothers are and how they deserve a big ol’ dollop of loveliness on Mothering Sunday (if not every Sunday). And, naturally as the owner of a small business whose sole purpose it is to provide unique, special gifts, it would have been remiss of me not to mention our gorgeous bags, or pretty earrings or our stylish pinnies. In short, it was open house at the temple of Mummy, and we were a-worshipping. But then I got distracted by One Born Every Minute. With the amazing Mum who had cerebral palsy and wanted to be present at the caesarean birth of her child so much that she pushed on through even though the anaesthetic wasn’t really working. And the Mum who had been through 2 rounds of fertility treatment because she was desperate to have a little one. And the Mum who’d had a nightmare pregnancy and just wanted to get her little girl out safe and sound. Mums are pretty darned awesome. So whether you buy her flowers, cook her dinner or take her for a spa treatment, it doesn’t really matter; just make sure you spoil your Mum this Mother’s Day. Chances are she’s worked pretty darned hard to bring you into this world – and I dare say she hasn’t stopped working since. I do? Oh, OK then. This weekend’s brief cemeo appearance from that big ball of burning fire in the sky has left the RT team, like many others I suspect, positievly hungry for summer. As ol’ George Harrison quite rightly croons – Little Darling, it’s been a long, wet, lonely winter… (or something to that effect) – and, Little Darling, it does most certainly feel like years since it’s been here. But here it was this weekend and, like most of the rest of the population lucky enough to see temperatures over 12 degrees – we were packing up the car and heading to the beach before you could say “unseasonably mild”. And it’s times like this that I realise how incredibly lucky we are to live in such a stunning part of the world. 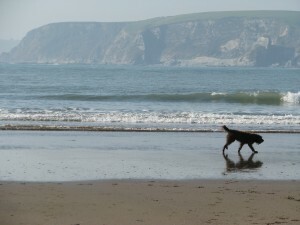 Like other Westcountry kids, I grew up with the luxury of only ever being 15 minutes away from a beach, and some of my strongest memories are from family holidays by the sea – whether it was basking in the sunshine or shivering under a blanket, the beach was a constant fixture in our lives. And on Sunday I got to take my little man for his second trip to the beach, where we enjoyed a glorious walk at Bigbury with the hound, and then a brief sit down on the rocks for him to have his afternoon snack (the little’un, not the pooch). It was a beautifully warm afternoon, not a cloud in the sky, and everyone on the beach was smiling. Memories are, indeed, made of this, and I sincerely hope come rain or shine, growing up by the sea will be something mini-RT comes to treasure as much as I do. So lets hear it for the summer 2014 – sandcastles, ice creams, surfing, rockpooling (naturally), jam packed coolboxes and sandy sandwiches, much needed windbreaks, paddling, snorkelling, falling asleep with our sunglasses on and washing sand out our hair for days… It’s going to be awesome. So I’ve spent most of the last week back on the craft fair trail for 2014. We maxed out on fairs in the run up to Christmas, and had a splendid time, but now we need to get over the winter blues and get back out there for the spring. I’ve already booked in fairs for April, May and (randomly) November, but our aim is to do at least one per month, across the length and breadth of this fair region of ours. Now – here in lies part of the problem; when you’re new to the scene as we are, booking a craft fair is a bit like walking up to a prospective partner in a bar; they may look good on the outside (snappy dresser, nice hair, not wearing white socks), but delve a little deeper and before you know it, you’re sitting in a freezing church hall next to some ol’ dear who crochets her own toilet paper. (OK, so my metaphor may be a little muddled, but hopefully you get the gist). Anyway – punts have been taken, caution has (to some degree) been thrown to the wind, and we’ve booked some more dates and venues in the calendar. Keep an eye on our home page for more details, but needless to say we’re hitting the road big style in 2014. And hey – it’s a numbers game: you kiss enough craft fairs, you’re bound to find your prince… (or something like that).